When working in Confined Spaces it is important to have adequate training in order to avoid entrapment or even worse, death. 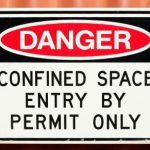 Luckily there are some measures recommended to utilize in order to understand the complexities of Confined Spaces Working. According to Work Safe, it is important for the employer to mention any confined spaces and the various hazards that accompany such work. Also the employer should practice the utilization of sign postings when required in order to secure the area. Firstly, oxygen deficiency in confined spaces can result in; slow oxidation reactions for organic or other substances, combustion, diluted air and gas, absorption of deadly substances by grains, or soils. Over-abundance of oxygen in confined spaces can be caused by contaminants , whether they be from solids, liquids or a various other forms. Adjusting the position of equipment can result in workers becoming overwhelmed and crushed. Some steps that employers must take to avoid many accidents, is the prohibition of smoking and naked flames. within confined spaces and the adjacent areas.Some equipment should even prohibited, such as the use forklifts. An additional concern is the level of heat while working in the area. Generic assessment : The employer is responsible for several confined spaces in which related work is performed at all sites. Risks factors are often identical but when this is not the case, a generic risk assessment is encouraged. This type of assessment helps identify the conditions and location of confined spaces and the type of work practiced in it. Depending on the type of work or condition of the site, the risk factors could potential differ from eachother. Change in work procedures or agreements.